The remit of Rent A Peasant is to provide an insight into everyday aspects of rural life in the past, from a housewife’s viewpoint. Farming is fundamental to the presentations, hence the sub title Living History with Livestock. 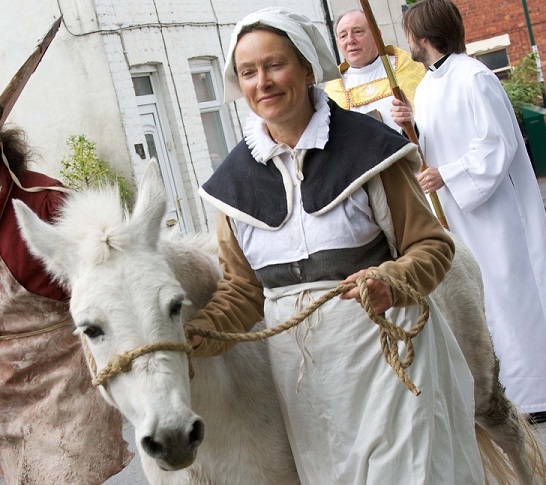 Since basic agricultural methods remained little changed from late prehistory to the early industrial period, Rent A Peasant can provide a costumed historical interpreter for events spanning the Roman, Anglo-Saxon, Viking, Medieval, Tudor and Stuart periods followed by a jump to the late Victorian/Edwardian period. Farming produces both food and the raw materials for clothing so Rent A Peasant can follow the processes, for example, from the live sheep to the meal on the table and the clothes on our backs. Rent A Peasant offer a variety of options to suit outdoor and indoor events at historic monuments, school visits and adult education. Both the Peasants and the livestock have been used for television work. The Peasants are suitably humble and will gladly consider slightly unusual requests, such as Witches for Hallowe’en. Rent A Peasant is based in Co. Durham. The logistics of looking after the livestock and the availability of associates are restricting factors for both distance feasible to travel to venues and availability for weekend events.